CloverLearns: cooking classes with Chef Andy at Fustini’s | Clover Eats! 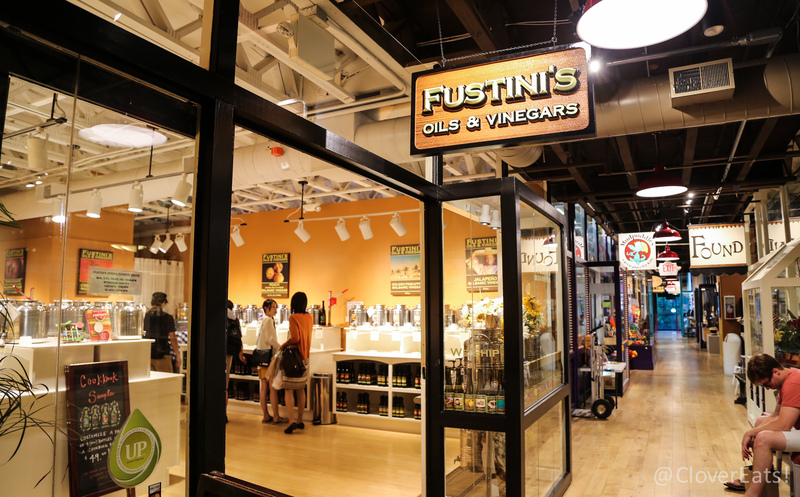 I’ve been a longtime fan of Fustini’s, the olive oil and vinegar shop in Kerrytown. Before I visited, I never realized just how much flavor you could infuse into one of these liquids. There are sample cups by each fustini, the large metal container, and the sommeliers are always offering mixture suggestions and ideas for cooking with the sauces. What I didn’t know is that Fustini’s has been building cooking areas in their stores. The Ann Arbor branch just recently opened up their kitchen, and is offering classes in their School of Cooking. 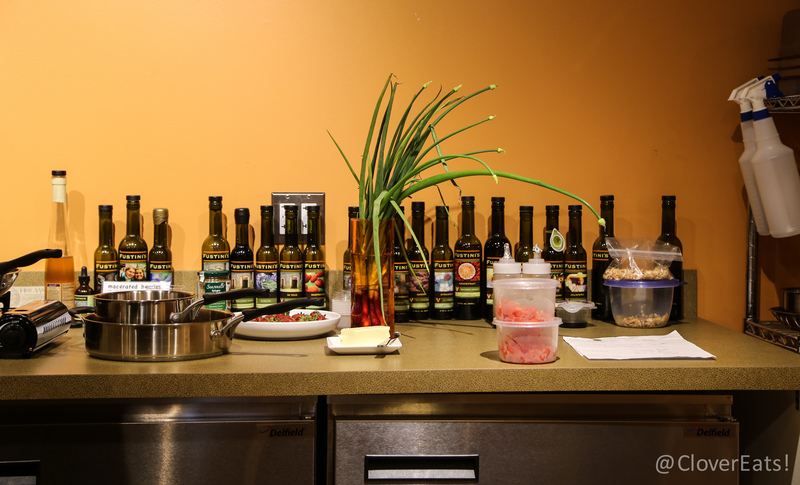 Chef Andy is a corporate chef who has worked in the restaurant business for over 30 years, and now is teaching oil- and vinegar-lovers all around Michigan recipes employing the wide range of Fustini flavors. I was incredibly excited when Fustini’s invited us to try one of their one hour cooking classes. These are their demo classes, where Chef Andy cooks and you get to eat! Other Fustini’s branches offer two hour classes, where you cook (and eat) your own meal. There are also lots of techniques classes offered during the day, with examples of how to make everything from emusilfication to drinks using olive oil and vinegar! The class was in a very intimate setting, with Chef Andy cooking right in front of us. In addition to Kevin and myself, the Food and Wine Hedonist, Mom Explores Michigan, and three lovely teachers partook in the class. I feel like I really got a great seat, and I was mesmerized by Chef Andy’s knife skills. I could watch him cook all day! He chopped food faster and more precisely than I’ve ever seen in real life, joking that the secret was not minding losing a knuckle. The Crab Stuffed Peaches were delicious, both sweet and savory! Chef Andy was very accommodating, asking what everyone “heat meter” was, and adding just the right amount of chili olive oil to each person’s dish. As Kevin put it, the Food and Wine Hedonist really lived up to his name, bringing two lovely bottles of wine that he picked out to accompany our meal. The Riesling he brought was fantastic! In addition to being a fantastic cook, Chef Andy was so articulate and engaging! He answered questions, demonstrated techniques, and narrated the process just as well as any chef with their own television show. He explained to us how he kept his knives sharp, how he used his honer several times a day, how when you cut with your knife, it makes little bends on the edge. The Parmesan Crusted Tilapia was perfectly browned. Chef Andy was also a marvelous story-teller, explaining how crab was processed, the difference between jumbo and lump crab, where the best kind of crabs could be found. He was so knowledgeable! He even went into the details of the pathogenesis of how salt water and freshwater fish were different, how the way that farmed fish were raised changed the way they tasted. My favorite dish of the night was the Whitefish Grenoble. The fish was amazingly soft, and the sauce was so flavorful! The event was great even for beginners like me; I didn’t know what it mean to ‘supreme a lemon,’ but Chef Andy explained and demonstrated it with patience and flair. The last dish was Shrimp Fra’Diavolo, which had an amazing sauce. Fra Diavolo means “Brother Devil,” and apparently refers to spicy tomato sauce for seafood or pasta. Right now, cooking classes at the Ann Arbor location are on Wednesdays and Thursdays, you can check out their calendar here! I definitely want to come back some time with my fiancé, since he does most of the cooking in our home; I think it would make a great date! Recommendations we got included the Tuscan Herb olive oil and the Fig balsamic, which were both fantastic. However, the biggest suggestion was to go for your favorite flavor – lemon olive oil can make anything lemony, raspberry balsamic can make anything fruity! This Saturday, Fustini’s is celebrating their four year anniversary by having free technique classes from 12-4! Stop by the second floor of Kerrytown to learn and taste! There are several upcoming one hour demo classes, $25/person and you get a $10 gift certificate to the store. You can also check them out on their website or Yelp! Thanks again for having us; we had a great time! Lovely pics – I hope to attend one of these classes in the future as well. They look wonderful! We had a blast! Hope you have a good time!